The journey from North to West Yorkshire is striking. The transition from open countryside to the gritty and grubby land of chimneys, factories and industry happens so gently you don’t realise that it’s happening, you just become swept along in the journey; you just don’t notice the countryside fading away to be replaced by the dark, solid terraces and the tall chimneys. Let me take you on a journey… we will start at Bolton Abbey, the ruins of a 12th century Augustinian abbey nestled in the valley alongside the wide, fast flowing river Wharfe, surrounded by rolling hills, farmland and huge trees. The landscape here is open, gentle, green. Next we will pass through Addingham, a busy village just across the border in West Yorkshire; a mixture of some newer builds, but mostly bewitching, traditional stone cottages, some dating back to the 17th century sitting on narrow streets with named ‘Druggist Lane’ and ‘Sugar Hill’. Continue along the A6034. Once upon a time there would have been a distinction between Addingham and neighbouring Silsden, but now it is impossible to know where one ends and the next starts – only the shop names give the game away. The buildings here have not got quite the same quaint charm as in Addingham. There is little doubt that this is a much busier place, and clearly a product of the industrial revolution. The buildings are darker, sootier, not dirty, just weathered by life and history – the years of smoke, traffic and hard work taking its toll; they are not unattractive, just somehow tougher looking, homely, welcoming, hardy. This isn’t where we are stopping though. We are going to keep going along the main road, very much a main road now, not at all like the winding lanes we have been travelling on. We pass through a five minute window of fields but they are scarcely noticeable, it doesn’t feel like open country because of the busy busy double lane road sweeping through the valley, round a big roundabout and SLAM. Keighley hits you in the face. Her shabby, rundown streets pull us in, the mixture of old and new; a shiny Weatherspoons directly opposite an aging cinema in much need of some tlc; the glistening dome of a mosque with its elegant minaret, the plethora of 20th century high rise apartment blocks mingled in amongst the row upon row of ﻿stone terraced houses. There is no escaping the frenetic busyness, the honking of horns, flashing traffic lights, sirens. It is the polar opposite from the start of our journey. This is West Yorkshire; it is dark, industrial, welcoming, busy, it is nestled so deeply into beautiful countryside, a heart that doesn’t stop beating. ﻿ As we move through Keighley, climbing out of the town centre now, we notice a tall, slim chimney set in the valley; a clear reminder of the role that Yorkshire played in the industrial revolution. Here we can see the rugged greens of the moors on the hills in stark contrast to the grey, terracotta, and black of the row upon rows of terraced houses and shops. This contrast of industry amongst country always makes me think of the beautiful William Blake line, “And was Jerusalem builded here, Among these dark Satanic mills?”. Since I was a little girl, Bradford and the surrounding areas have always made me think of this line from ‘Jerusalem’ – the towns and cities, mysterious shadows in stark contrast to the vivid greenery. From high up on the moors above Keighley, Baildon and Bingley the mills and chimneys look so small; close up they are giants, watching over the city. It is my idea of Jerusalem, even if it wasn’t Mr Blakes! Anyway, enough of the poetry, back to the journey – we are almost at our destination. Although Keighley faded a little, it didn’t exactly stop; one town merges into the next village, almost as if they are growing ever closer to each other, the only indication that this is a different place is the decrease in businesses and shops and an increase in housing. We turn to the right, drop down a winding steep hill, into the valley, past the train station, round a bend at the bottom and then back up the other side of the valley. To the right is a steep drop down, to the left we are dwarfed by houses, not dwarfed because they are tall houses, but dwarfed because of the steepness of the side of the hill that they are built into. This is not the picture of Haworth that you see in the tourist guides, and it is certainly not the Haworth that would have greeted the Revered Bronte and his young family when they arrived from Thornton in 1820. The famously cobbled Main Street is hidden from view for now, it has been surrounded by modern buildings. As we continue up the incline it is impossible not to notice that this is an immensely popular tourist destination. There are brown signs and hoards of people, young and old, from all around the world. At the top of the hill, next to the jammed car park, is the famous parsonage. It is a grey, non-descript, solid stone building, side on to the car park with very little to give it away as being the home of an extremely brilliant family and the birth place of some of the most popular classsics of English literature. 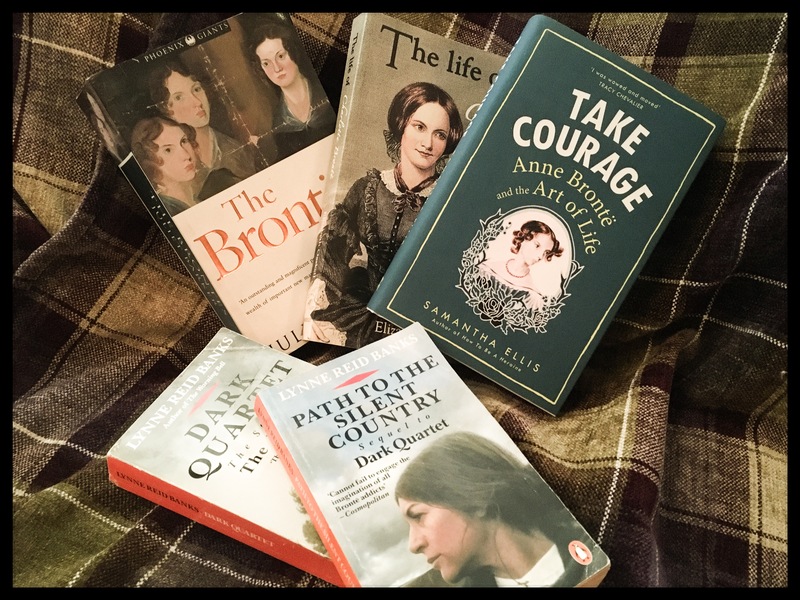 Without a doubt, Charlotte, Emily and Anne Bronte wrote unique, imaginative, beautiful books, but the story I love most is their own. Since my first visit to the Parsonage aged six, I have been fascinated and besotted. As I have grown older I have devoured book after book, research piece after research piece, desperate to learn more about this family about whom so little is known – the tragedies and triumphs that shaped them and their writing. The resilience of the three younger sisters (the eldest two daughters died in childhood), their determination to make their own way in the world and succeed as writers at a time when the publishing industry was dominated by men; the heartbreak and consequential downward spiral of their brother as he fell into a world of drugs and drink; the spinster aunt who came from Cornwall to look after the six children and their father after the death of their mother; the father, Patrick, the Cambridge educated, Irish reverend who outlived his wife and children, who is often portrayed as a strict and solitary figure… I want, no, I need to know more about them. It has become a never ending quest. In 1820 the parsonage was isolated at the top of the steep, cobbled village. Its closest neighbour was the graveyard to the front, and the Sunday school to the side. It would have been surrounded by open countryside and moorland, exposed to everything the elements could throw at it. Mortality in Haworth was high, disease rife, and most people did not make it to adulthood – the expected lifespan was around 26 years. Nowhere is this more evident than in the graveyard – such a high proportion of the graves are dedicated to babies and toddlers, families losing child after child, brother after sister. The graveyard lies at the bottom of the parsonage garden, separating it from the church. Today the graveyard has trees. Lots of trees. In 1820 these were not here. The landscape was harsh and barren, punctuated only by somber headstones. 200 years on and the parsonage is still the last stop between the village and the moors but it is no longer alone; the village has grown, moved up the hill to embrace its parsonage, and draw it in. The parsonage itself has also grown; there is an extension to the side which the Bronte family would not recognise, and at the rear is the much more recently built gift shop and ticket desk. It is 2nd January 2017; the last possible day to experience the ‘Charlotte Bronte: Great and Small’ exhibition, curated by the author Tracey Chevallier (Girl With A Pearl Earring) ﻿to celebrate the bicentenary of the birth of Charlotte. The exhibition has been carefully developed to explore the contrast between Charlotte’s restricted life in Haworth and her tremendous ambition and talent. I know, I know, it’s a bit last minute – tomorrow the museum will be put to bed for a month, closed to visitors, wrapped in tissue paper, cleaned and prepared ready for the new exhibitions for 2017, this time dedicated to the bicentenary of Branwell – ‘Mansions in the Sky’. I did come in the summer to see the exhibition, but became a little distracted in the ‘Children’s room’ (more later), and didn’t manage to make it around the rest of the museum before the minibus left for home. But now, I’M BACK! There are so many visitors here today, some coming to catch a last glimpse of the Charlotte exhibition, some very dedicated Charlotte fans, some who have visited many times before, some enthused by the recent Sally Wainwright film, “To Walk Invisible”, and others who are not familiar with the family at all but who have been told that the parsonage is the ‘must see’ attraction in Yorkshire. There is no set ‘flow’ around the museum, so long as you only go up the stairs and not down – if one room is full, simply go to another and come back, and photography is now permitted as long as a flash is not used. Despite the crowds of people it is a peaceful place, no pushing or shoving, there is a sense of calm, intrigue and awe. As I go into the dining room I can’t help but wonder what reclusive and private Emily would think if she could see the hoards of people trapesing through her home, looking at her things, fascinated by the lives of her and her sisters. I would like to hope that, although she was so resistant to fame, publicity and didn’t really want her work out in the public arena, she would feel a glow of pride that the legacy she and her sisters created burns still, the mixture of languages murmured in each room testament to their worldwide accolades. ﻿The first three rooms, Patrick’s study, the dining room and the kitchen, are set up as they would have been when the family were at home. If it weren’t for the rope cordons and unimposing information signs you could almost believe that the family had just popped out and would be back at any time. In January the house is still ready for Christmas, with greenery over the mantelpieces and an abundance of tiny robins perched on various items. The sign in the dining room indicates that this is the sofa ﻿where Emily is believed to have died, and in this room, on this very table, those famous novels were conceived. The house is filled with personal belongings of the whole family, items which have been donated, searched for, and hunted down, but they are items which could be in any house, they are innocuous, nothing gaudy, nothing out of the ordinary, only the tiny piano in Patrick’s study seems unusual, delicate, dolls houseish. It is homely here, there is a huge sense of family, but it betrays no hint of the genius that flowed within the stone walls, nothing screams “‘Jane Eyre’ was written here!”. It is subtle, tasteful and real, not luxurious, but certainly not uncomfortable. A museum to celebrate the life that was here, not a mausoleum to commemorate the tragic deaths of its young inhabitants. 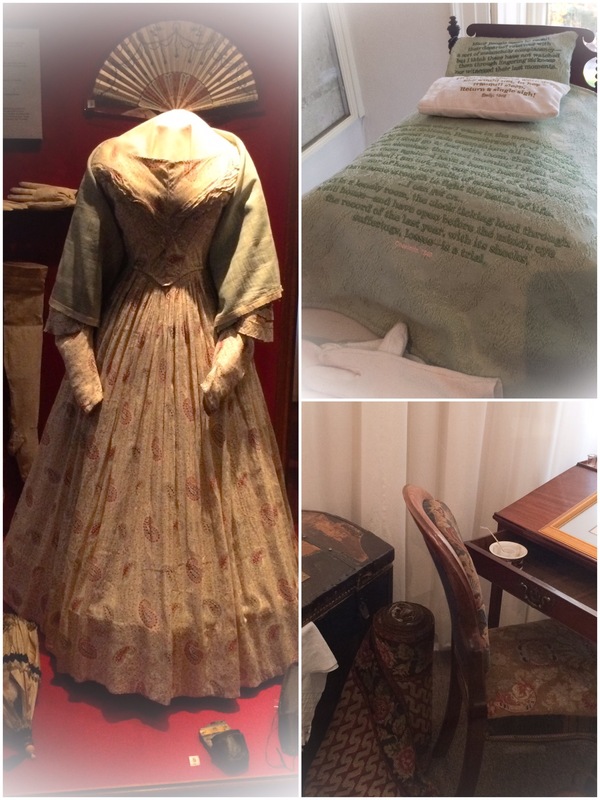 As much as possible has been done to ensure that the decor is as close to how the Bronte’s would have had it – there are enough books and letters out there describing how various visitors such as Ellen Nussey and Mrs Gaskell found the parsonage, and these have been researched thoroughly to give each visitor an honest and realistic Bronte experience. The pale blue paint in the hallway, the wallpaper in Arthur’s study and in Patrick’s study have all been replicated. Charlotte’s room was expanded around the time of her marriage to Arthur Bell-Nichols, prior to this it had been occupied by Aunt Branwell until her death, originally shared with baby Anne. It is here that Aunt Branwell taught her young charges their early lessons. It is now home to Charlotte’s personal belongings. Her dress, her stockings, the bonnet she wore for her wedding and so many other items. This is where you become acutely aware of her tiny stature, at 4’10” Charlotte was a force to be reckoned with – the Shakespearian line, “though she be but little, she is fierce” seems appropriate in light of Charlotte’s well documented fight to achieve success combined with her petite build. The eldest of four by accident of nature, Charlotte was by far the most outgoing of the three surviving sisters, she held the ambition and passion to succeed. The opposite to the home loving, feisty, shy, no nonsense Emily. I can imagine the sisterly arguments that must have taken place here. There is little in this room of her sisters, tiny slippers embroidered with Emily’s hair – exquisitely beautiful, not grotesque as you could imagine, a writing desk, but mostly this room is about Charlotte – it is after all her bicentenary, Emily and Anne’s time will come I am sure. Everything has a simplicity and prettiness about it, there are no frills and furbelows, but no rags either – these are the respectable belongings of a country parsons daughter. The must luxurious items are a pair of immaculate gloves, looking as if they belonged to a child, but which are actually Charlotte’s size, embroidered with tiny maps. 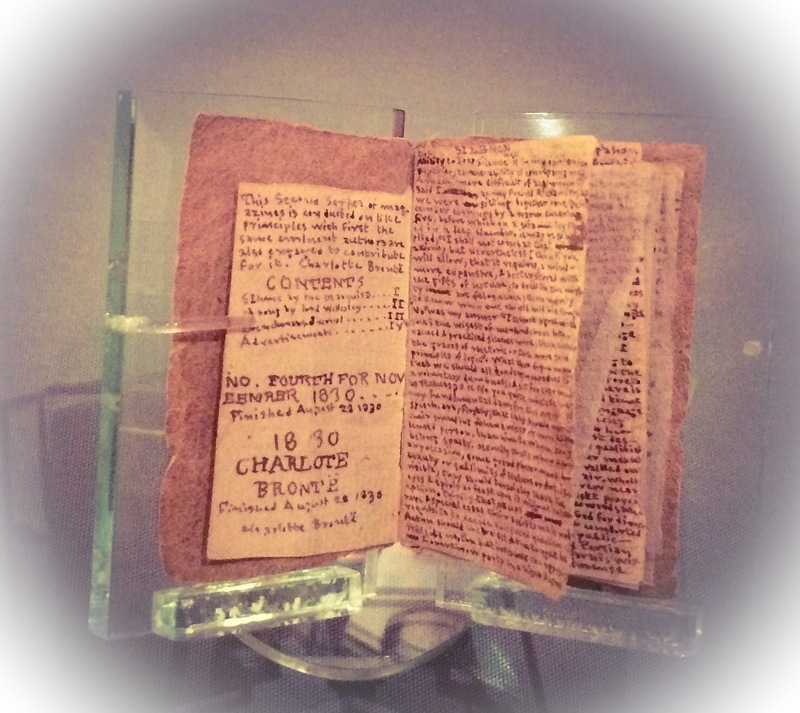 I would love to think that these belonged to Charlotte, but there is a disclaimer at the end of the display which hints at some of the items being replicas, the only indication that sometimes fact and fiction merge – a phenomenon synonymous with the Bronte family myths. Next to Charlotte’s room is the Children’s room – my personal favourite! You have to look very closely to see what is special about this room – the glass on the wall is not there to prevent crumbling… This is the room where the tiny Bronte’s played, where they squabbled over Branwell’s wooden soldiers, and where the fantasy worlds of Gondal and Angria were born. This is the room where the magic began! Every time I visit I love to spend time in this room investigating the sketches and etchings on the wall, imagining the children playing out their stories; being children. This is by far the smallest room in the house, but in my eyes, the most evocative. There is little on show, but much to see and feel – emphasised by the emptiness of the room compared to the others in the house. This year there is a tiny bed in the centre of the room, the only actual ‘thing’ in the room, made up with tiny pillows, sheets, duvets, each item embroidered with words or quotes belonging to the Bronte world; some are from books and letters by the Bronte’s, some are things that have been written or said about the Bronte’s. Patrick’s room is the only upstairs room displayed as a bedroom – the bed is not the original, but a replica of the one sketched by Branwell in his haunting picture of death. To protect his family from intruders, (he was very aware of the Luddite rebellions across West Yorkshire) Patrick slept with a loaded pistol under his pillow; each morning he would discharge the weapon out of his bedroom window, frequently hitting the church tower with his bullet – the gunshot marks can still be seen today. Once Branwell had spiralled into his drink and drug infused malady he was moved into this room to sleep with his father so that he could be ‘kept an eye on’ following a misadventure and lucky escape with a candle. It must have been torture for Patrick to watch his only son, night by night, slip so deeply into his own personal hell, so much talent dissipated by heartbreak, drink and laudanum. This boy who was once the hope of his family, the one who was destined for greatness, quietly overtaken by his sisters in their quest to provide for themselves when he could not do it for them. Patrick is often portrayed (thanks in part to Mrs Gaskell) as severe, detached and cold, somewhat aloof from his family. To me, this does not fit in with the caring Papa who tended his failing son day and night, watching over him, soothing his agitations ﻿and trying to protect him from his demons.